Experience the richness of one of the major commentaries on the Chumash. The Ramban is chockfull of penetrating insights on the Pshat, Aggadic and Hashkafik level. 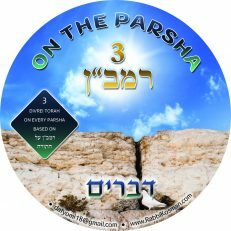 With a time investment of 10-15 minutes, you can connect to 3 Rambans on each Parsha. In this shiur the Ramban is explained both outside and read carefully inside, plus translated into english. Share it with your family and guests at the Shabbos seudah. Enjoy the feast!